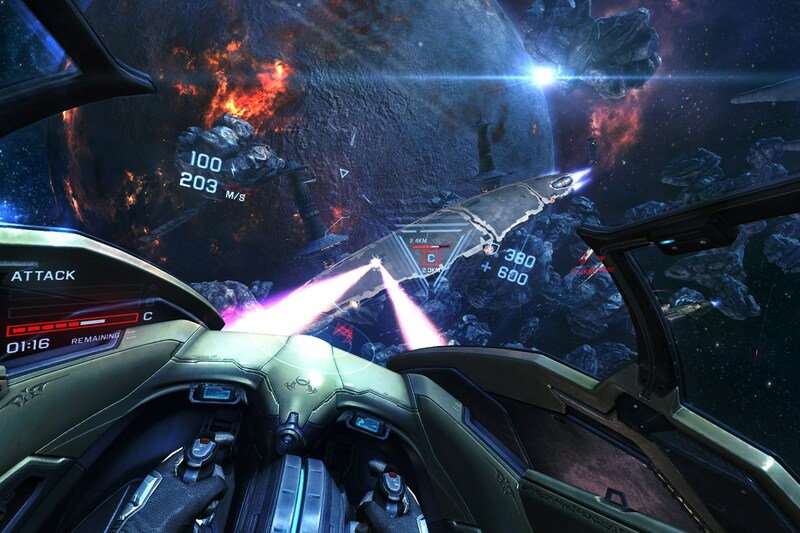 With delivery of the first consumer editions of the Oculus Rift due March 28 and EVE Valkyrie a launch title, the reality of production VR and a killer-app space-fighter game are mere months away for those with the wallet and inclination to preorder the bundle. 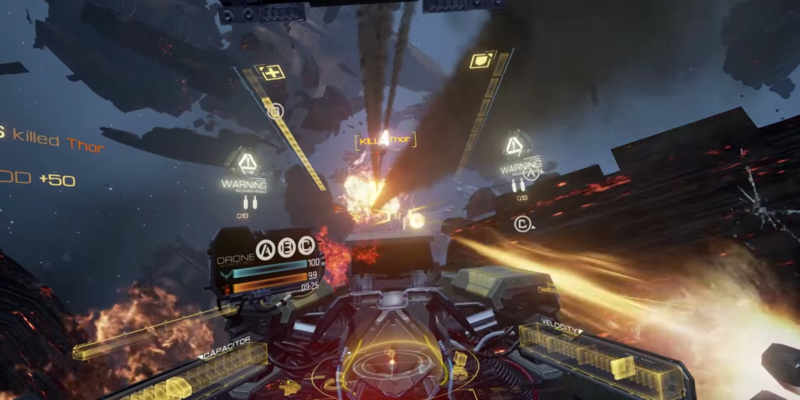 However, for months now, enthusiasts who owned the developer kit 2 version of the Rift and were accepted by CCP to test Valkyrie have been participating in a pre-alpha test, putting the game through its paces. The problem has been that, due to an NDA, we haven’t been able to talk about it. Until now. So first, the caveats: I’ve been using a DK2 which is not representative of the CV1 hardware. Additionally, I’m running on a fairly high-spec computer – a high end i7 with a GTX 980 and oodles of RAM – so it’s very difficult to comment on the finer details of performance and quality. With that said, the results of a smooth, high frame-rate experience are magic; the whole notion of presence that Oculus have talked about is incredibly fun to experience. Truly immersive VR may not work for everyone, but with those it does work with, it’s almost a spiritual experience, eliciting awe and laughter at the experience of being transported into another world. 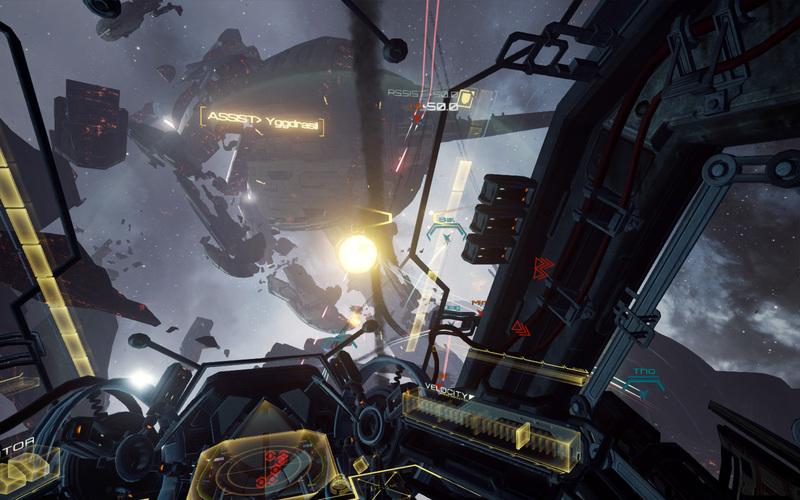 This all starts with Valkyrie’s UI, which follows in the steps of some modern first-person games by placing your camera, your head, upon an actual body. In a way no monitor based game could, that body fully articulates as you lean and turn to look around in VR, sufficient to trigger a body transfer illusion that really has to be experienced to be understood. Valkyrie pilots are always seated, whether inside their vehicle or at the Crow’s Nest perched above the main hanger, cleverly serving as Valkyries main menu system. 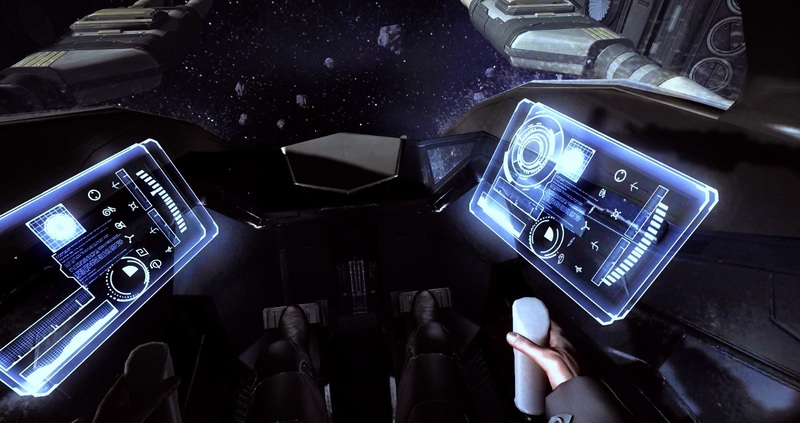 The overlaid HUD melds both controller input and selection by directed gaze which reduces the amount of head-craning involved in navigating the menus. Flying in Valkyrie is sublime. According to good VR practice, most acceleration is fairly instant and a constant, forward velocity helps reduce any VR sickness that might occur. Naturally, being in space and able to pitch, yaw, and roll about in all directions does carry some potential to still make some sick, much in the way anyone might be if they happened to be seated in the back of a Red Bull stunt plane. All the weapons have satisfying feedback and the much-lauded missile system, complete with head-directed locking, is still as fun as it was in the Fanfest builds. The current build appears to have five maps: Cathedral, Convoy, Forge, Necropolis, and Shipyard, each offering a unique environment, be it asteroids, decrepit stations, the wrecks of EVE ships, or the giant beams of a ship construction facility. 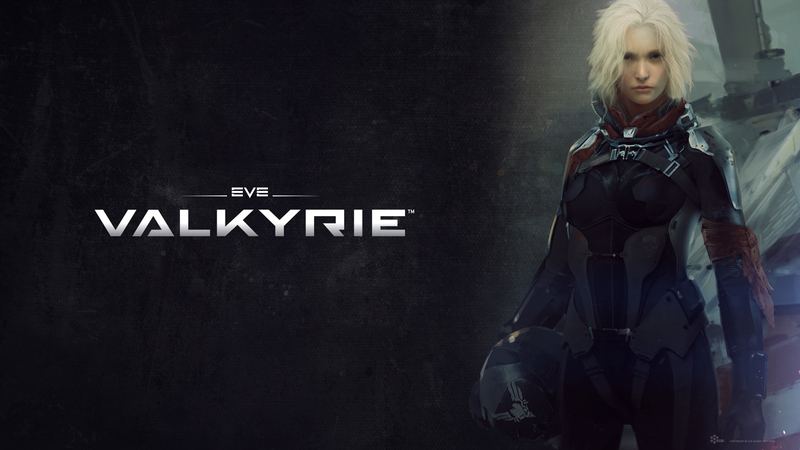 For a solitary experience, most of these maps seem to offer one of three modes: Recall is currently available on Convoy and appears to be the story mode of Valkyrie, offering up the experience made popular by the gameplay trailer shown at Fanfest 2015. Whether Recall missions are coming to the other maps is unclear, but for those keen to experience more of the story of Rán first-hand should remain hopeful. Scout mode is for those looking for a more relaxed, combat-free experience, perfect for letting your luddite friends and family experience the wonders of VR without being repeatedly shot down by some HOTAS-loving neckbeard. Finally, there is Survival, which seems to be your typical escalating wave-based PvE experience. For those looking to get to grips with the game, there is a basic training map, plus training for each of the three main classes in Valkyrie: Fighters, Heavies, and Support. Each ship has four primary stats: Firepower, Armor, Shield, and Speed. However, the tendencies for fighters to be fast and for heavies to be tanky don’t fully represent the true differences between the different classes. The differences in weaponry and auxiliary abilities really give the ships individual flavours. Each ship has a minor set of upgrades that boost stats, but these upgrades never feel significant enough to seriously disadvantage a new purchaser, merely offering minor benefits to those who really stick with a ship. In this build, Valkyrie has five fighters: the Wraith, Dominator, Accord, Assuage, and Aegis; four Heavies: the Spectre, Rhino, Goliath, and Storm; and four Support: the Banshee, Guardian, Warden, and Sentinel. Ships can also be upgraded with decals and camo options, although naturally these are pure vanity items. The economy of Valkyrie isn’t the simplest around. First off, you have basic experience (XP) earnt in battle which contributes to your pilot level and mastery of a given ship. All XP earnt slowly unlocks the tech tree, giving you progressive access to new ships. Ship upgrades, however, are gated by XP earnt while flying the ship in question. Next, you have silver credits, your basic currency, and gold credits, your premium currency. Finally, you have salvage, which comes in Raw, Component, and Prime varieties. Salvage is dropped by defeated ships into space and must be picked up by flying through them. Various combinations of silver credits and salvage are required for purchasing ships, upgrades, and camo, while silver also sinks into the launch tubes feature. Launch tubes represent the ships you bring with you into battle. By default, you always have one nominated ship you can respawn in an unlimited amount of times. With silver, however, you can elect to have up to three other ships to choose from when launching, but each launch of these other ships must be paid for in advance. Naturally, this flexibility cuts into your end of match profits, but can help fill a tactical gap if things aren’t going your team’s way. Gold credits don’t have much use in this build, although the premium shop does appear to feature as a ‘Coming soon’ menu option. More ominously is another ‘Coming soon’ menu option whose icon naturally associates with skills in EVE Online; it’s possible that some form of skills and a skill tree is coming to Valkyrie that has yet to be overtly talked about. Valkyrie is using Ari’s Active Monetization Platform as announced back in October 2015, but details of what that will entail still remain to be seen. All in all, Valkyrie is laying a very solid foundation on which to follow the likes of multiplayer giants that have come before it. If they can strike the right balance of progression, daily and weekly missions and benefits, and frequent events, Valkyrie should have the same perpetual replayability of any fast, addictive round-based PvP game. The biggest threat to Valkyrie’s success right now seems to be Oculus, whom many feel have priced out their own market with the price point for the CV1 Rift. However, the rate at which the preorders have sold, combined with Valkyrie being bundled with every one, does mean that anyone with a Rift is probably going to be playing Valkyrie the day they get it. For a while, Valkyrie is going to be in the enviable position of being the only competitive VR title on the market, and that is a position that the title deserves. Like all great EVE players, Danikov lives in Scotland, where he enjoys deep-fried food and the world's best whiskys. Despite being an eclectic player of games, EVE has been his one and only MMO ever since late 2011.